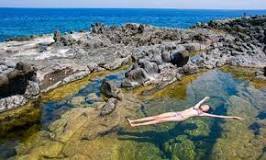 Going to Italy, you can’t miss the Pantelleria Island, having its Venus Mirror Lake, which is one of the most charming and unique place the island can offer. It is not that deep- only 12 meters– and the water level is about 2 feet above the sea level, being of course powered from the rain during the very hot spring. In that period of time, in fact, temperatures can arrive at 40-50° C, so be ready to wet a lot, and bring comfortable clothes only. Located in the north part of Pantelleria, the lake lets you have an amazing view of the area, due to its position: it is situated in the crater of an ancient volcano, occuping the very bottom part. Due to this reason, on the south shore of the lake there is a termal station, having both warm and saturated waters, offering the greenish-black mud which is rich of nutrients, such as the thermophilic algae, which have the characteristic sulfur smell and are very important for the human skin, since they can give them some benefits, offering the body a much better shape and let the person feel better, fresh and young. Bugeber’s Lake, the other name of the lake, is definitely one of the jewels of the island, having its water sparkles like a blue and green gemstone, the beautiful colors you can see there while exploring around. Choose between one of the most exclusive spa in the area, having a full treatment like you never tried before. Relax while having some breathless views at sunset, seing all these colorful light into the sky, surrounded by the waters of the lake. Most of the tourists really feel like they are having the time of their life, going there and literally fall in love with the place.